QCD 9410 - NATT OG DAG! 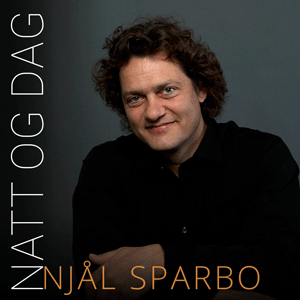 "Natt og Dag" is the second recording of an anthology of Norwegian songs, arranged for bass-baritone voice, harp and string quintet by Njål Sparbo. 4 Den varande fugl - David Monrad Johansen / Trad. Most of the songs in “Natt og Dag” (“Night and Day”) were originally written in higher keys for song and piano, except for the songs by Nordheim and Åm, which were written for song and harp, as well as Sommerfeldt’s piece for song and solo cello. Many composers could have been included in this anthology, and the selection of songs in this recording is not meant to be authoritative or representative from a music-historical perspective. The songs were chosen merely because I enjoy them, because they are rarely performed and because I consider them to be suitable for my arrangements for bass-baritone, harp and string quintet. Still, “Norwegian Songs vol. 2” presents songs by 18 Norwegian composers who in various ways moved towards new forms of expression after the culmination of the national romantic period, combining elements from European and Norwegian art song tradition in interesting ways.